December temperatures were a bit below average with many nights below freezing that has required frost coverage for the garden. Covering the plants has helped to keep the sensitive peppers, tomatoes, eggplant, and basil plants healthy and happy. The eggplant finally slowed down its production. The cayenne and serrano pepper plants are steadily producing ripe red peppers. I have 1 melon plant, with several melons, that has survived in a warmer south facing location with frost coverage. The tomato plants are hanging in there and have flowers, but will need some warmer weather before we get any fruit. I have started harvesting the carrots, lettuce, cabbage, snow peas, bok choy, and cilantro. The cauliflower, broccoli, beets, mustard greens, spinach, kale, endive, and chard are all doing well and should have some to harvest in January. I got 2 gourds and 4 Armenian cucumbers, from the compost volunteer plant, before the vines succumbed to the cold weather in December. We harvested the last of the pomegranates in December and the plant was pruned back. We had about 7 dozen pomegranates harvested from 1 plant this year. It got too cold for the Cosmos, so all but 1 plant has been removed. The tidy tips continue to do well and the nasturtiums and marigolds have begun to bloom. December is when I start my seeds indoors for spring planting. I have small plants of melon, cucumber, peppers, zucchini, eggplant, tomatoes, and multiple herbs that will be ready for late February or March transplanting into the garden. 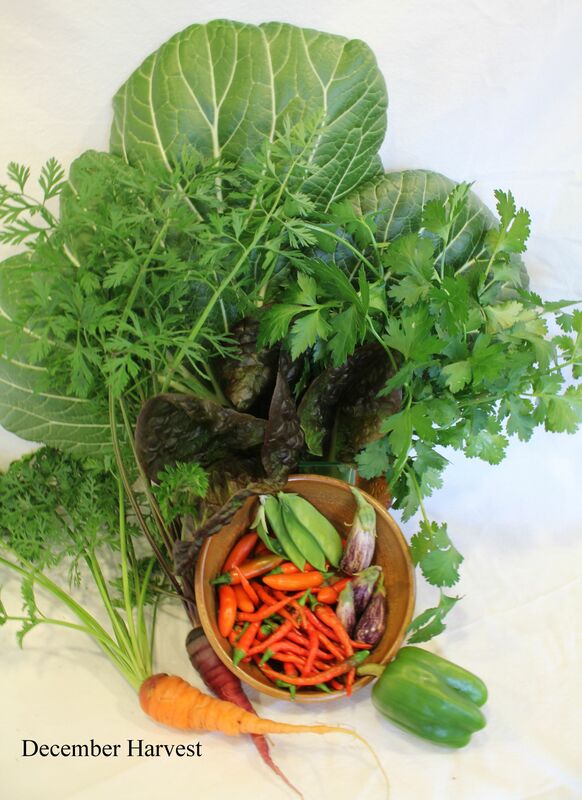 December Harvest picture - Bok Choy, Rouge Romaine, Carrots, Cayenne & Serrano peppers, Fairytale eggplant, Bell pepper, Snow peas, Cilantro, and Parsley. I harvested 2 Corsican gourds and 4 cucumbers before the cold weather killed the vines. The bok choy, lettuce, cabbage, cilantro and parsley are steadily producing. All the endive plants are doing well and enjoying the cold weather. The snow peas are producing! The gourd vine and cucumber volunteer finally succumbed to the cold weather. The colder weather has slowed down overall growth of the garden plants. We will continue to have cold nights in January, so keep the pepper, tomato and basil plants covered with garden cloth to protect from the frost. A thick layer of mulch (4" - 6") will help keep the roots warmer. Remember to feed your plants with compost, or foliar feeding of worm tea or seaweed/fish emulsion solution to keep them healthy through these colder months. Choose low chill (number of hours between 36 - 48 degrees) variety fruit trees for the low desert. Now is the best time to plant bare root trees and vines. Nectarines do not grow well in the valley. Choose varieties that only need 100 - 300 chill hours. Plant blackberries in an area with afternoon shade and plenty of room to spread. Some low chill varieties that do well in the low desert below. 1. Plant bare root fruit trees and vines. 2. Trim flowering trees and evergreen shrubs. 3. Trim fruit trees and grape in late winter before bud break. 5. Add mulch to bare soil. 6. Add compost and volcanic rock to your garden soil. 1. Don't prune frost damage from plants or trees until late February. 2. Don't water grass at night as this will foster fungal disease. 3. Don't delay weed control, handle them when they are young before they sprout. • Vegetables: Artichoke, Asparagus, Beets, Bok choy, Broccoli, Cabbage, Carrots, Cauliflower, Chard, Collards, Kale, Kohlrabi, Leeks, Lettuce, Mustard, Green Onions, Peas, Potato, Radish, Spinach, Turnips. • Herbs: Borage, Calendula, Catnip, Chamomile, Cilantro, Chives, Dill, Feverfew, Rosemary, Thyme. - Minty Rice with Feta and Pomegranate Relish - This is a festive seasonal dish due to the pomegranate seeds and it received a lot of compliments from friends and family. Q: Is it time to trim back my pomegranates? A: Yes, once the fruit has been harvested in December/January you should trim back the plant.